How filled with awe is this place! She arrives every morning at the same time - you could set a clock, if you wished - but there are no clocks here and and no need for clocks. It was past seven, that much I knew, and I still groggy in my bed. There'd be a calling out, "Madame Randy, kafe rive!" - Coffee is here! That's how it goes with names here. Names and time. Concepts are different. When I am with my neighbors here on Mon Bouton, my mishpuchah - that's Yiddish - not Kreyol! - for community, or extended family, or simply, my peeps. I'm on the inside, way in. "You're not a visitor, Madame Randy, you are one of us!" chirps my young colleague Toma. But Toma has his own opinions. Always. Here, my need for hot coffee is legend. I keep it in a thermos and drink it, gulp it, throughout the day, not like the Haitians do. In the mountains, having coffee - serving coffee - is a big deal, rather like a Japanese tea ceremony. A very big deal, as coffee is precious and sugar is...well, extremely expensive. Neither commodity grows on trees...so to speak. But, in this one area, I diverge from local custom and splurge, extravagantly, having coffee every morning, and then some. It's a paying job, for Meli's grandmother, and also for Meli, whom I tip for the errand - not too generously, for it would raise jealousies and clamorings from others here, many others, for their turn, for paid work too. Melianiece follows my hand movements through countlessAmerican children's songs: "B-I-N-G-O," "Itsy-Bitsy Spider," and "Twinkle Twinkle." I think, finally, we got it just right. Then, the girls teach me a thing or two…Nap danse! Melianiece was one of the first to test the waters, so to speak, when the water project was completed. Her uncle's home, where she lives and works and gets to go to school, is one of the closest to the spigot. 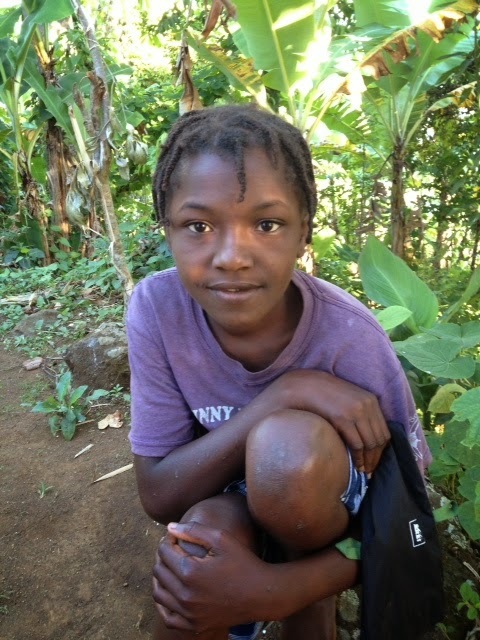 She lives here to help out, as her aunt is recovering from one of many frequent maladies in a Port au Prince hospital. The family lost a 5 month old infant in the same hospital, died of unknown causes. Mali's aunt was one of the most emaciated, under-nourished mothers in the entire region. A few summers ago, she had once confided in me that she felt that she had no skills, couldn't do much of anything, was useless in the fields, and too weak to carry a load - literally and metaphorically. Somehow, she birthed a sturdy boy, and then a girl. And then lost one. Now Melianiece cares for those cousins. Let's shake our sillies out!